While you are busy giving different sorts of hairstyles and hair color treatments to your customers, it is equally important for you to ensure that there is no color spillage on the clients’ clothes. For you to present yourself elegantly and cleanly, Salonwear offers you an all-in-one cape and robe combination. You can wear it with remarkable comfort and satisfaction. These capes can also be worn as drapes. 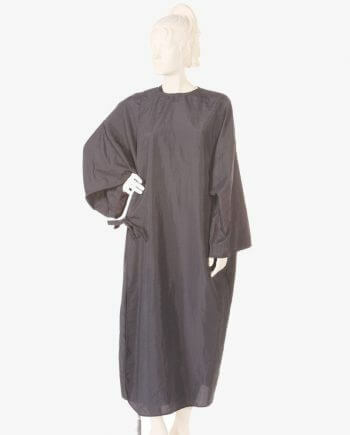 A wide variety of salon robes including salon drapes are available for purchase at Salonwear. Our custom drapes are very popular with our clients. The Silkara iridescent fabric makes the product one of the top quality attires in comparison to similar products by other manufacturers and sellers. Other features of the product, like resistance to water, stains, harmful chemicals and hair colors, provide it an extra edge over any other cape drape product available in the market. Along with this, the design of the attire allows you to wear the cape drape in different fashionable styles, making the same dress look innovative in itself. It also prevents you from getting bored of the dress! Such qualities will surely make the cape/ drape one of the hottest-selling products! Other offerings at salonwear include Designers Gown, Big Shirt, Sleeved Cape And Gown, Client Gowns, Euro Wrap, Short Client Gown And Short Sleeve and much more. Salonwear offers you the custom drapes in a fixed size. You may adjust the fitting of the cape according to your physique. These capes/ drapes are made up of Salonwear’s top quality, Silkara iridescent fabric. There are a lot of other products offered by Salonwear, such as salon apparel, spa uniforms, cutting cape, barber cape, client gowns, grooming smocks, aprons for women, spa wraps and the list goes on! Salonwear capes/drapes are available in black color, giving your salon a professional look at all times. When you are buying these capes/drapes for your salon, we give you the option of getting customized logos embedded on it using embroidery or screen printing techniques. This way, you can have the capes personalized and embedded with your salon name or logo! Enthralling the fashion segment since the past 31 years, Salonwear has become the go-to place for a large number of loyal and regular customers. Our vision is to deliver the most disruptive and first-of-its-kind salon wear so that you can promote your salon as a style icon by using our products. With the range of products we offer and the pace at which we are expanding our roots in the market, Salonwear is bound to become a one-stop-shop for the masses in near future. Talking about ourselves, Salonwear is an organization, a family venture which continuously exceeds the increasing and innovative demands of its customers. Allowing us to serve you will definitely give both of us a positive and memorable experience, making the bond between us stronger than ever! Top quality apparels and accessories. Wide range of options for you.